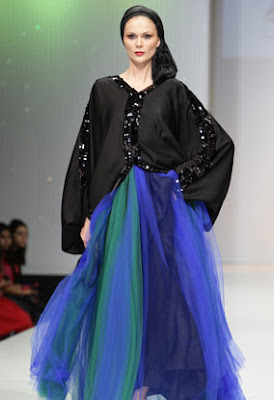 Day 2 of DFW saw sisters Reem and Hind Beljafla present abayas from their label DAS Collection. 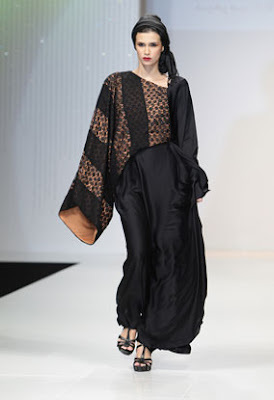 I love the creative cuts and combinations of different fabrics within the body of the abaya itself. Any favourites? I love your blog! Thanks for soo much effort! oooh! I love the second from the top on the right!!!! So classy and it's a welcome change to the belted batwing abayah I've been seeing around lately. I'm gonna have to save up plenty of pennies, to be able to afford that gorgeous creation! these are really cool outfits. That black & purple abaya looks so pretty! mashaAllah i love 8..how can i buy 1 of dos?